Scientists are warning that, thanks in part to climate change, a plant traditionally found in North America is now spreading across warmer parts of Europe, and that in years to come this could be very bad news for people who suffer from hay fever. Researchers from the University of Leicester, writing in the journal Nature Climate Change, say that ragweed pollen could as much as quadruple across northern Europe in the next 50 years as temperatures clime, making things more agreeable for this notorious plant. Ragweed is a rather unassuming plant to look at but, for those with pollen allergies it can have big consequences. Ragweed, which isn’t native to Europe but was imported in the nineteenth century, pollinates long into autumn months, meaning that allergy sufferers can expect extended allergy seasons. 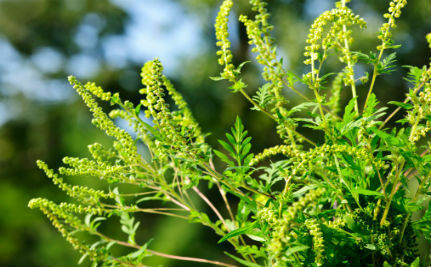 What’s more, for those who are sensitive to pollen, ragweed tends to provoke severe reactions even at relatively low pollen concentrations, including provoking asthma-like symptoms, all of which adds up to a not too bright prospect for European allergy sufferers. The researchers say that ragweed is gaining a hold in Europe regardless of climate change. However, their computer simulations predict that, based on our current use of coal, oil and gas, carbon dioxide concentrations in the atmosphere could help to facilitate the plant which in turn could increase the pollen-count dramatically. As a result ragweed could manage to infiltrate areas that currently have little-to-no trace of the plant, including parts of France, the UK and Germany. Other factors unrelated to climate change mean that this spread is likely anyway, including the fact that the plant is very resistant to current herbicides. Given that one ragweed plant is capable of producing as much as one billion seeds in a season, trying to control that amid a changing climate that is making the habitat more favorable to the plant could be incredibly difficult. This isn’t some distant problem however. Last year, researchers from the same university recorded that ragweed pollen levels in the East Midlands in the UK had reached sufficient levels so as to be a problem for those who have these allergies. Temperatures in the East Midlands are usually too cool for ragweed to survive, however milder winters could help it to survive and, in turn, help it to gain greater footing in previously hostile areas. So how do we deal with the threat of ragweed? As above, ragweed is probably going to increase in Europe anyway but the research leads us to think that by reducing greenhouse gases and thereby helping to get rising temperatures under control we might be able to at least minimize our own contribution to helping ragweed spread. When it comes to ragweed there are also some red flags around relying on herbicides. Many plants are becoming resistant to our current crop, and as we increase the herbicide’s power and try new herbicides, there’s always the threat of unintended consequences like the neonicotinoid and bee colony collapse disorder link that has been much discussed in the press. At any rate, this research at least suggests that the possibility of climate change making life harder for allergy sufferers is not something we can dismiss lightly, and is yet another reason that we need to take action to ensure that we don’t exacerbate environmental problems that are already in the works, and don’t create new problems by enabling invasive species in the future. It should be simple to identify and dig it out on your own property at least. Hard times ahead, I'm afraid. These kind of problems is what forces people to realize the reality of global warming. Unfortunately, it's not going to get better any time soon. I've seen clouds of yellow pollen rising from fields of ragweed. Just going to get worse. Interesting. Till now I'd only heard of European, Asian, etc. species of plants and animals who "invaded" North America (e.g. starlings, leafy spurge, pine beetle). Unfortunate for our Brit friends that ragweed is coming to them.